At centre of Amiens, with great view of the Hôtel de Ville (pedestrianized area). 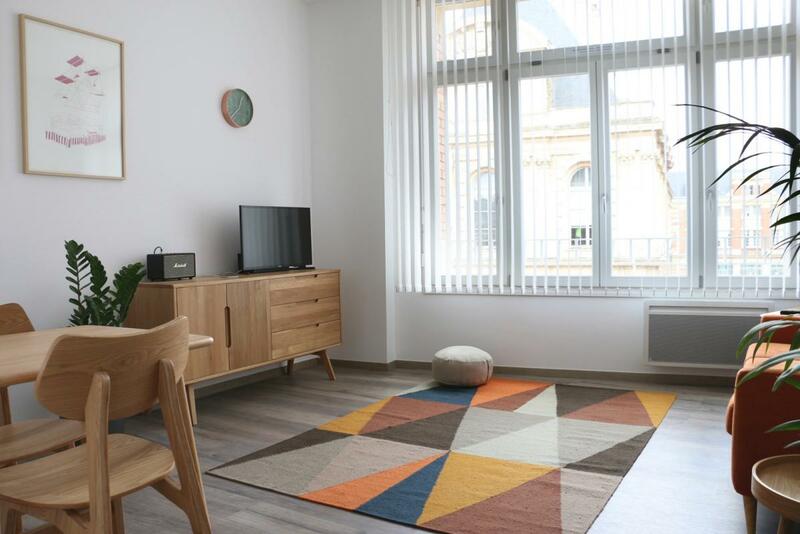 Character apartment (45 sq.m.) in which modern, functional English furniture is combined with graphic arts. 2nd floor with lift. Fitted kitchen (fridge-freezer) opening onto living room, sleeping alcove (140x200cm bed), shower room/WC (towel drying radiator). Heating & electricity included in rent.|Beds made on arrival, towels supplied, cost of cleaning included in rent. Bike shelter available. Parking below apartment building. Tourist tax charged extra. Interior terrace (4 sq.m. ).